I stopped counting the number of times the Lagoon 42 marketing materials mentioned the word “curvy” at six. Then I saw the boat and understood the emphasis. Lagoon’s newest cruising cat is indeed both curvaceous and sleek, not to mention fun to move (or lounge) about. The freshly designed 42, which replaces the 420/421 of which over 270 hulls were built, also makes tracks, whether on short island hops or a bit farther afield. 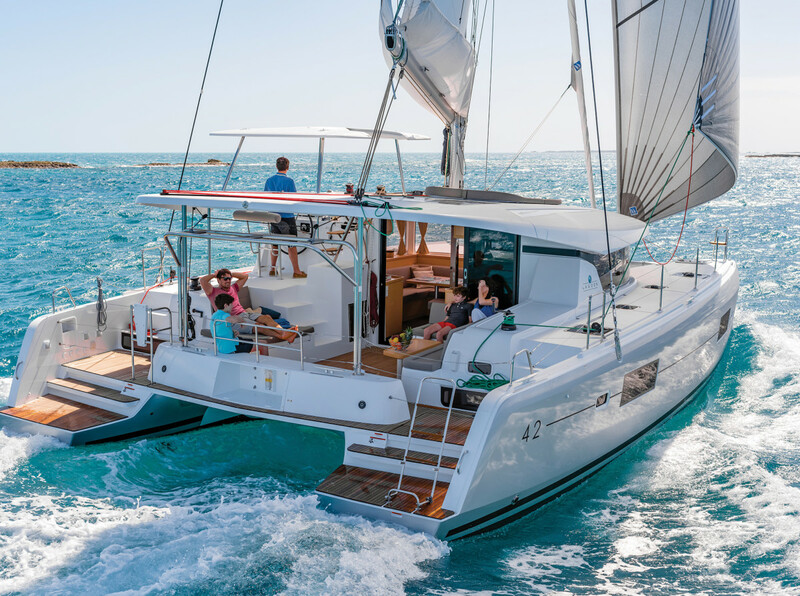 Exterior designer Patrick Le Quement teamed up with the naval architects of France’s VPLP Design, renowned for their racing hulls, to create the Lagoon 42’s swoopy lines. The underside of the gullwing bridgedeck was configured to minimize pounding in rough seas; the glazed vertical windows that bend around corners cut down on heat inside; the composite bimini angles up, giving the impression of suspension; and the circular coachroof forms a compound curve all around the cabinhouse. Yes, the curves abound. The boat has also slimmed down, thanks to the infused, injection-molded construction that yields an all-up lightship weight of just over 26,000lb. A structural center beam adds strength and also secures the forestay fitting, a Code 0 sprit, the anchor roller and an anchor chain well that runs atop the beam rather than below. As with the 42’s sisters, the 39 and 52, the VMG Soromap mast has been set aft to open up the foretriangle and allow for more downwind sail choices. It also keeps the weight centered to reduce pitching. The compression post is in the center of the saloon, where it actually makes a good handhold. The boom is shorter while the mast is taller, creating an efficient high-aspect-ratio sailplan. With the square-top mainsail by Incidence Sails (which adds another 40ft² of sail area over the standard mainsail), clean air at the top powers the boat more effectively. Meanwhile, at deck level the self-tacking jib moves on a track forward of the mast, thereby making shorthanded sailing easier. The deck is dedicated to improved circulation from one end to the other. The transoms are wide enough to preclude any embarrassing moments boarding from a dock or dinghy, and just two low steps lead up to the single-level cockpit. 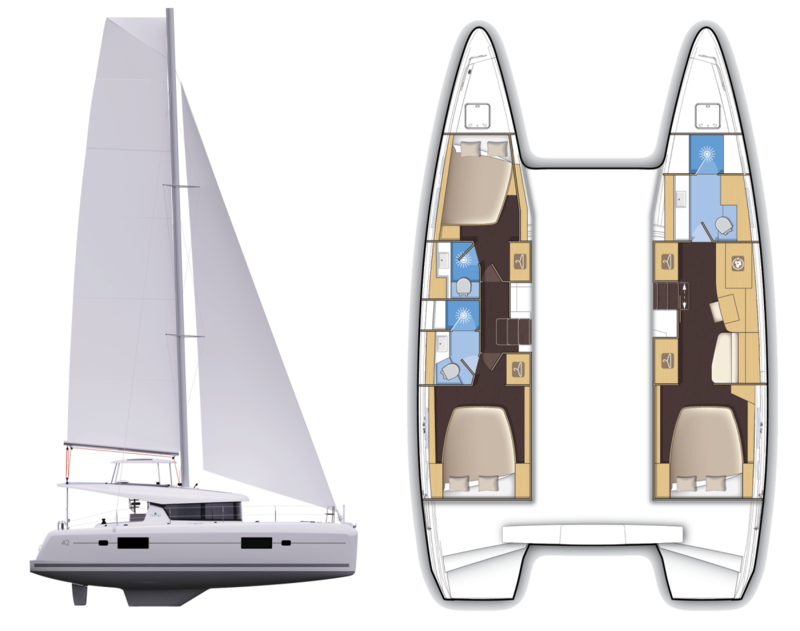 Here a dinette to starboard will seat eight, a lounge to port will be cozy for two, and another small seat spans the space just ahead of the davits. The raised helm is to port, and much thought went into its design. First, communication is easy from here to the cockpit while visibility forward is fairly good, especially if you’re tall. Second, unlike typically crowded helm stations, there is plenty of room for two people to work, one steering and one working the two Harken winches that manage most of the lines. There is even room behind the helm seat for a third person to stand or pass through down to the cockpit. Despite its ample size and power, the boat can be easily sailed singlehanded, as everything—from the B&G multifunction display to the Spinlock rope clutches—is within reach of the Goiot wheel. Steps also lead up to the coachroof for access to the boom or the integrated sun pad. The helm ergonomics have truly been optimized, from the centered window cut into the composite top that provides a clear view of the mainsail, down to the many handholds for anyone who doesn’t have a grip on the wheel. In contrast, there are no handholds mounted on the coachroof itself, although you can run your hand along its finished bottom edge and steady yourself as you move forward. That’s slick, but so is its curved two-foot edge comprised of smoothly finished fiberglass without antiskid. Not only will this surface be slippery for anyone up top, it’s hard to climb up onto the high cabinhouse from the foredeck, especially with wet hands and feet. A three-panel glass door leads seamlessly from the cockpit to the saloon, which is located on the same level. The U-shaped galley is split, with a three-burner Eno stove and a single sink to starboard and refrigeration to port. The top-loading fridge is just at the edge of the stairs to the port hull and it is a bit awkward to reach into its depths while balancing on the second step. The L-shaped settee runs athwartships and also serves as a seat for the outboard-facing nav station, which I find to be quite welcome for dedicated ship’s business. A second set of B&G instruments here allows for a quick position check when the autopilot is driving up top. The saloon is spacious and will move traffic well, but it would benefit from an overhead hatch, as the only ventilation comes from two forward opening windows. Our test boat featured the owner’s layout, with the entire starboard hull dedicated to the private master stateroom. Aft, the island bed is nice and low for easy access, and the large hull windows let the captain check out the surroundings without getting up. Amidships, a desk is a nice addition. The head forward takes up a third of the hull, with a huge shower compartment that has plenty of room for even the largest of crew. The aft cabin in the port hull has the same low island berth as the owner’s cabin and a private head with a separate shower stall; the forward cabin has an integrated head/shower combination and provides access to the bow compartment that may be used as additional sleeping quarters. Overall, the Italian styling of Nauta Design adds an elegant touch, which can be personalized with a variety of different fabric and décor choices. The base price starts at $340,000, but with delivery, commissioning and most of the options featured on our test boat, the final cost will be $120,000 or so higher. For our test sail I had the run of the place—literally. With only four people aboard this big boat, it felt like the closest thing I could get to experiencing ownership while still having to give the boat back afterward. With a light breeze of 8 to 10 knots true wind, we maneuvered out onto Miami’s Biscayne Bay and under the Rickenbacker Causeway bridge. We had to take the center span rather than the designated bridge channel because the air draft is almost 68ft, and we didn’t want to scrape the antennas off the top of the mast. Once outside, the wind was light, but we did manage to hit 6.1 knots in 11.6 knots of breeze at 50 degrees. Despite the light conditions, the boat tacked smoothly and without any hesitation as the bows came through the wind. The real fun came next as we set a giant aquamarine 732ft² Code 0 that dwarfed pretty much everything around us, including Lagoon’s new 63ft power cat that came alongside to take pictures and toss us some liquid refreshments. At a 75 degree apparent wind angle, we sailed at 7 knots in just 10 knots of breeze. Our speed then fell to 5.3 knots as we bore away to 110 degrees. (Later, the boat went to Bimini and reported doing 15 knots in 22 knots of true wind on flat water with the kite up.) I wished for windier conditions, but since that was not to be, the next best thing was sailing back under the bridge with the enormous gennaker flying. I’m sure the traffic on the causeway took note. Our test boat’s optional twin 57hp Yanmars (standard is 45hp) with saildrives and Flexofold folding propellers, delivered 7.8 knots at 2,000 rpm and 8.7 knots at 3,200 rpm with the throttle wide-open. Tankage is light with 79 gallons for both water and fuel. Owners wishing to venture farther will need to increase both. It seems Lagoon has hit the right note with the 42. Presumably, 80 percent of these new models will be sold to private individuals with the rest going into charter. 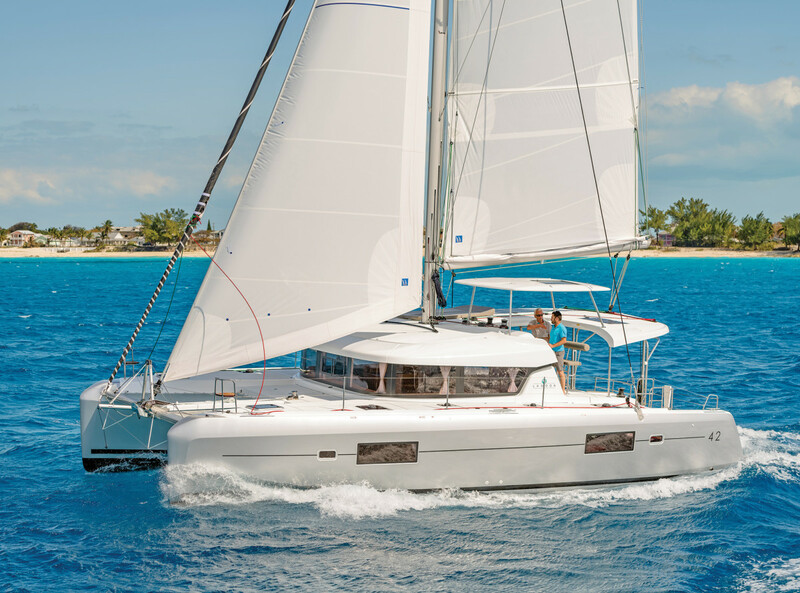 With a bit more fuel tankage and the right suit of sails, the Lagoon 42 is a delightful kitty to cruise here, there and everywhere.